In his second-to-last film role Elvis plays the boss of a traveling medicine show filled with lecturers, motivational-speakers, quick cure salesmen and more. When the show lands in Chautauqua things get complicated as Walter Hale (Presley) and his crew become involved in the investigation into a murder and other problems. That trailer doesn’t get to that murder plot until halfway through its running time, though, and even then only gives it a small amount of attention. Instead the focus is on Elvis singing and balancing a steady stream of women all eager to fall into his arms if they’re not getting on his last nerve. Elvis famously was drafted into the Army in 1958, serving two years, largely in Germany. 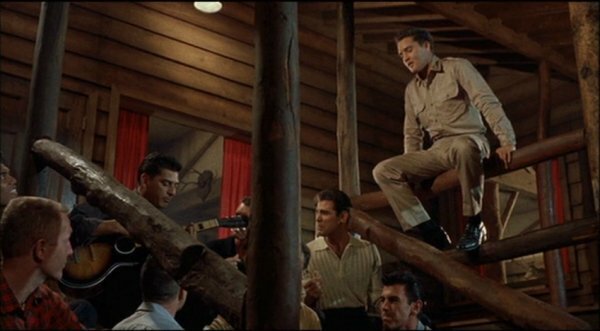 Kid Galahad reflects some of that as Presley plays Walter Gulick, who returns to his small New York hometown after leaving the Army. Despite wanting to make an honest living, his boxing prowess leads him to a professional fighting career. We see in the trailer him as a fighter and getting into trouble outside the ring as well. From there on out it’s the usual combination of singing, dancing, romance and more that are common themes in selling most of Presley’s films, including him taking a moral stance against someone who’s asking him to compromise his ideals. Elvis’ film debut casts him as Clint Reno, whose older brother went to fight for the Confederacy in the Civil War. When that brother comes back, Clint has married Vance’s old girlfriend. Clint gets caught up in Vance’s involvement with the theft of Union money, money he now wants to return. 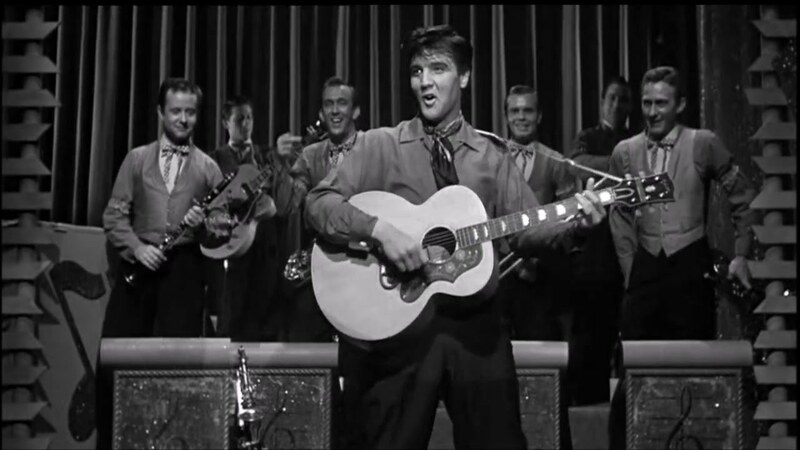 “Here he comes” we’re told as the trailer opens with a shot of Elvis singing and dancing. The story is positioned as a dramatic love triangle between Clint, Vance and Cathy, while working hard to introduce Elvis to theatrical audiences. It’s notable how he’s not the focus here, despite the presence of the title track and an ending that features a handful of other songs. It’s playing off his brand while not hanging success entirely on his unproven shoulders. Once more Elvis is cast here as a “troubled young man.” This time he plays Glen Tyler, a ruffian from the backwoods who comes under the wing of counselor Irene Sperry (Hope Lange), who encourages him to develop some obvious writing talents. The trailer starts out by promising “songs of love” for the audience to enjoy, with him performing those songs, often directly to one girl or another. There’s trouble with some locals, though that’s never really explained. It never really gets into the story of him being nudged in a productive direction by Sperry, instead making the appeal mostly about the music and the romance. One of two movies on this list set in the years following the Civil War, this one has Elvis playing Pacer Burton, the mixed-race son of a white man and Native American woman. (woof with the lack of actual representation). Because of his mixed heritage, Pacer may be the only one capable of establishing peace between the native residents and the White settlers intruding on their land. There’s lots of shirtless-Presley in the trailer, which shows him fighting with a Native American, threatening white men who he feels are responsible for the death of someone he loved and more. Two conflicts are sold here, the one between the two sides of Pacer’s heritage and the other between the two women he must choose between. Another movie that ties into Elvis’ history in the Army, this time he plays Chad Gates, who’s returned to Hawaii after serving his time. Not content to follow his parents’ wished and help run the family farm, he becomes a tour guide at an agency run by his girlfriend Maile (Joan Blackman). 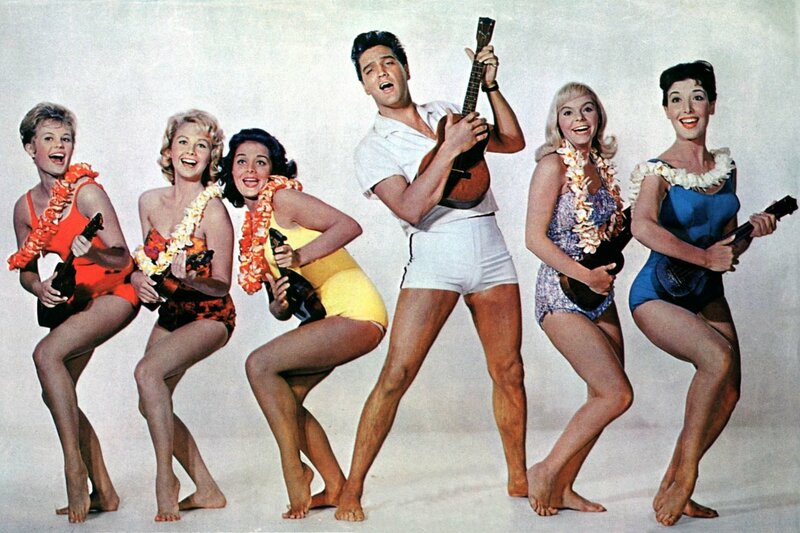 There’s not much of that story in the trailer, which is instead devoted to making the primary selling point Elvis engaging in romantic and other hijinks in the exotic location of the Hawaiian islands. 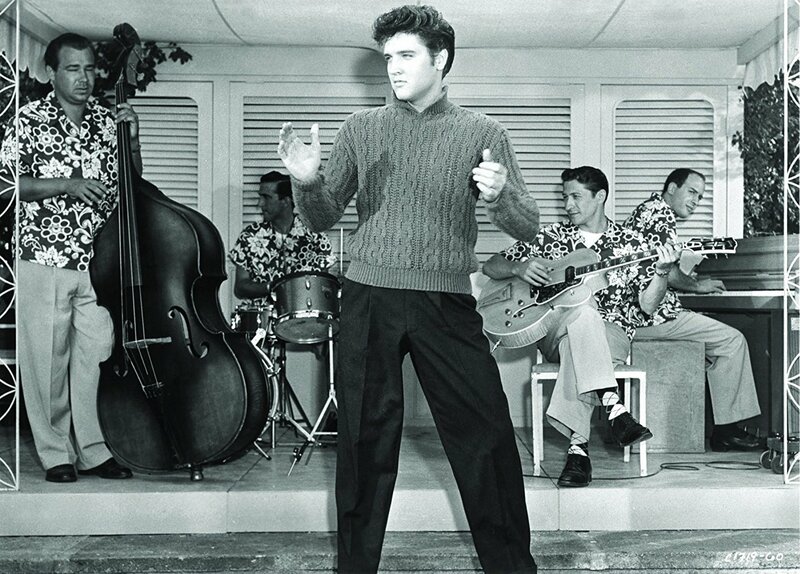 With that hair and those dance moves , Elvis was seen as a bad influence by the older generation during his time. So it makes sense that Jailhouse Rock would position him as a bad boy, though one who’s trying to reform. Presley plays Vince Everett, who decides to try and make a living in the music business after he gets out of jail, where he’s serving time for manslaughter, eventually going on to great success. That bad boy image is the first we see and hear about as the trailer opens, introducing Vince as a tough kid learning a hard lesson in prison. When he’s out, though, it’s all about music and girls, though it’s clear he’s still got a temper that can flare when provoked. This is the movie that would define Elvis’ public persona in a major way and it’s clear the marketing played a big role in writing that creation myth. It’s interesting how relatively early in Presley’s career this came out considering so much of his later reputation would be centered around a glitzy Vegas-driven schtick. Here he plays race car driver Lucky Jackson who works as a waiter in Vegas to help earn money to upgrade his car. That doesn’t mean he doesn’t have time for a little romance, though, this time with Rusty Martin, played memorably by Ann-Margaret. The trailer kicks off with the title song and establishes the setting. The romance between Jackson and Martin is very much positioned as a match of equal wits and sensuality, her rebuffing him and holding her own against his game. In fact Ann-Margaret is every bit Elvis’ equal in terms of billing and attention on all fronts, with plenty of shots of her singing and dancing. Here Presley plays Danny Fisher, an aspiring singer and musician who performs in a nightclub to support himself and his unemployed father. While the club he frequents is on the up-and-up, he can’t escape the influence and reach of Maxie Fields (Walter Matthau), a crime boss who controls much of the other area entertainment. The trailer makes it clear we’re catching Elvis at “the top of his career,” with this being a turn for the dramatic. So we’re sold a story of a rough young youth who wants to make a decent living in a crooked system while also being torn between two available female love interests. I’m pretty confident if we looked at trailers for the other movies in Elvis’ filmography we’d find those patterns repeating themselves with some regularity. So you certainly can’t say Hollywood didn’t know what to do with him, it just kept doing variations on the same thing over and over again.